I remember the first time I heard the Paul Di’Anno-fronted Iron Maiden as a kid, which was well after I heard and fell in love with the Bruce Dickinson version. See, as a youth with zero internet, hardly any money, and not a lot of friends with the same musical interests, it wasn’t really that easy to go and explore a band’s back catalog. So it took some time before the band’s self-titled debut and their follow-up “Killers” made their way to me. Friends at the time who had heard the Di’Anno years and knew my love for Dickinson’s work warned me that I wouldn’t like the early stuff. They were right. I didn’t like it; I loved it! There was something about the dusty sound, the vintage power, and the punk rock energy that really excited me, and while it felt like a completely different band than the one I was used to, this version was really exciting as well. This discovery also led me to eventually exploring the NWOBHM bands (a Lars Ulrich-backed compilation tape helped out a lot), and even stuff like Scorpions, Thin Lizzy, Blue Oyster Cult, and Rainbow, the bands that were setting heavy metal’s foundation and roadways for genre jumping and thorough exploration. To this day I still have affinity for bands that play classic heavy metal, and a great example of that is Christian Mistress, a band that’s become one of my favorite acts in metal. On those same lines is the label Shadow Kingdom Records, a place that has championed lesser-celebrated classic heavy metal bands such as Manilla Road, Pagan Altar, and Altar of Oblivion, who all made incredible entries into the metal world but just didn’t get widespread attention that would get them mentioned regularly alongside the groups we already cited. But they also have been reaching out to younger bands who have the same classic heavy metal fever and the chops to do it right, and they’ve found a killer new entry in Corsair. This Charlottesville, Va., four-piece band grew out of an annual Black Sabbath tribute group, when some of its members decided to get serious about making music of their own. That brought together guitarist/vocalist Paul Sebring, guitarist Marie Landragin, bassist Jordan Brunk, and drummer Aaron Lipscombe to form Corsair and get headed down the road toward making the brand of hard rock and heavy metal they loved. 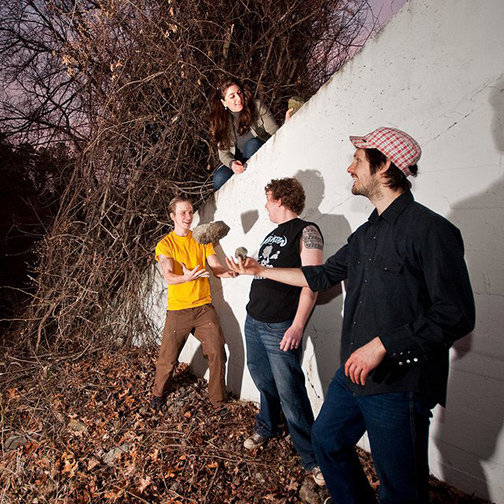 That led the band to putting out two EPs –2010’s “Alpha Centauri” and 2011’s “Proxima Centauri” — and eventually a self-released, self-titled debut full-length, a piece of work that would bring them to the attention of Shadow Kingdom, who are now re-releasing the record to a wider audience. If you love old-style, true heavy metal, you’re going to want to track this down and get some beers, because you’re in for a huge dose of fun. The record starts off with a blast of an instrumental, as “Agathyrsi” unloads catchy guitar riffs, some classic rock thunder, and a nice late ’70s/early ’80s ambiance that gets you ready for the rest of the record. “Chaemera” is your first full blast of Corsair magic, as the song has a driving NWOBHM feel, more air guitar-ready riffs, and vocals from Sebring that are perfectly crafted for this song, with singing that’s clean but laid back, striking at those Thin Lizzy comparisons. “Falconer” — and the band’s going to have to forgive me for this one, if need be — starts with a punk-fueled melody line that reminds me of Coheed and Cambria’s early work. It’s ultra-infectious and makes you want to drive your car faster. Again, Sebring strikes perfectly, inserting passion and drive into his vocals and never going over the top. Like the band I just mentioned. “Gryphon Wing” ups the emotional ante, and it’s one of the most metallic songs on here, though Sebring reaching for a higher register doesn’t totally work. The vocals are a bit thin and stretched, something a strong backing vocalist could have covered up. No matter, it’s still a good song. “Path of the Chosen Arrow” kicks off the second half of the album, with more classic metal guitar work for which backpatch-adorned jean jackets were made, though the vocals again are a little shaky. “Mach” is a spirited, spurty instrumental that keeps your juices flowing and your energy high, taking you into “Of Kings and Cowards,” a song that sounds patterned after the early days of Maiden, with grittier vocals and a faster tempo. Closer “The Desert” is trippy and spacey for the most part, with vocals that go a little higher than they probably should, but it rocks out for the most part and provides a memorable ending to a really super album. So many bands purposely try to do a vintage sound and just come off as pretenders. 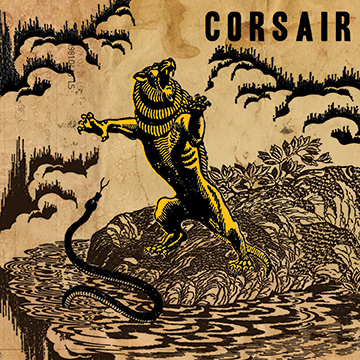 Corsair genuinely appear moved by the sounds of what you hear on their debut record, and if they were transported back to the late ’70s or early ’80s, no one from that time would think anything is out of place. This is just a damn fun album, a killer slab of classic heavy metal, and a promising debut from a band whose bright future is built on the past. Can’t wait to hear more.